One of the most difficult aspects of eating a ketogenic diet can be eating out. If you forget your keto-friendly lunch at home one day or find yourself starving without time to cook, it can feel impossible to find a fast food option that won’t kick you out of ketosis and stall your weight loss. Bacon + coffee = keto fast food! You can eat keto anywhere (yes, even at fast food places) as long as you know what and how to order. This keto fast food guide will show you exactly what’s available at the top keto-friendly fast food restaurants, how to order and how many carbs each option contains so you can eat out confidently. Remember: You should eat real, whole foods as often as possible. Keto isn’t healthy in and of itself; it’s the quality and nutrient-density of your food that determines your long-term health. Use these options when you’re in a pinch — not as your main sources of food. Before you dive in, we’ve put together a FREE keto meal plan for you so you don’t have to eat out. Click here to get your keto meal plan for free. Most of these restaurants are available just about anywhere. Whether you’re out with friends or on a road trip, here are the best places to scope out your low-carb fix. You can find a Subway just about anywhere, and although it’s a sub shop, any of their sandwiches can be turned into a salad, instantly slashing the carbs. Choose a sub option, make it a salad, add cheese, focus on low-carb vegetables, and pick a low-carb dressing from below. Subway also has a useful Nutrition Calculator so you can plan ahead. Many people love Chipotle for its focus on sustainability and fresh food. If you’re one of those people, you’ll be happy to learn that it’s very easy to stay keto at Chipotle! To plan ahead before going to Chipotle, check out their Nutrition Calculator. McDonald’s is a classic for quick and cheap fast food, and it’s no enemy to the low-carb diet if you just toss the bread. For a morning caffeine boost, add a black coffee. When you ask for no bread, they’ll usually serve these in a bowl with some lettuce and a fork. Some places might not know what to do if you order “bunless,” but just order and toss the bun. Stay away from the hot cakes, hashbrowns, burritos, and oatmeal. Chicken nuggets are off limits, as the breading makes the carb count rise quickly. And the fries are obviously a no-go. For more, see McDonald’s Nutrition Calculator. Stick with burgers, cheeseburgers, grilled chicken sandwich, Whopper, or Double Whopper without bread or ketchup. Some of the other sandwiches, like the Farmhouse King, creep up in carbs without lots of customization. 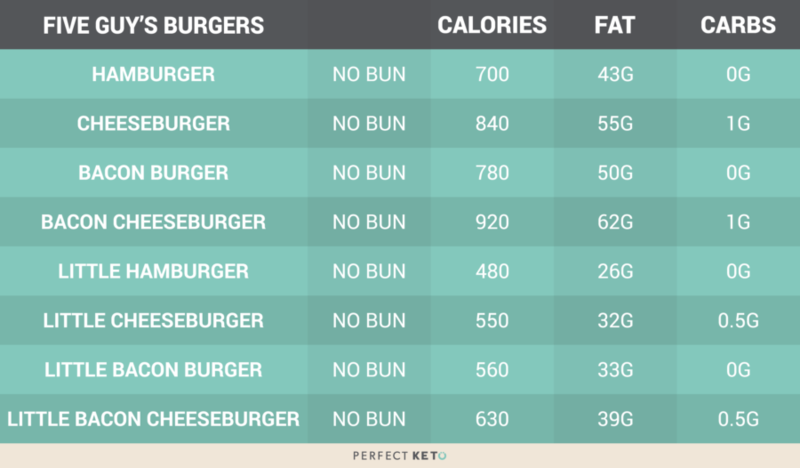 For more nutrition info, see Burger King’s Nutrition Calculator. Arby’s is known for its roast beef, but they have a variety of meat options and you can order many of them sans bread for a low-carb alternative. Pair any of these breadless sandwich or slider with a side salad for a bigger meal. See Arby’s Nutrition Calculator here. To save money and get what you want at Taco Bell, stick to sides. Then you don’t have to pay for taco shells just to throw them out. Order a side of lettuce, side of beef, side of chicken, and side or two of guacamole, then combine for a quick and cheap meal. Just one medium-sized piece of fried chicken here is around 8-11 carbs. But if you still have a craving for some chicken, there are a couple of grilled options. 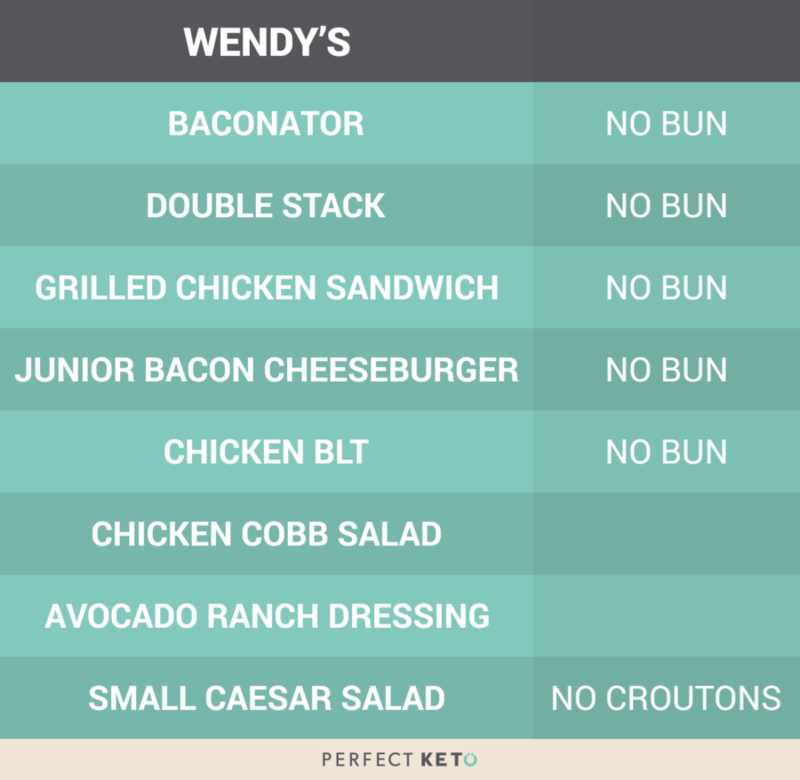 Wendy’s is another burger-heavy place, so like the others, you can make do without kicking your body out of ketosis by removing buns. There’s no nutritional information on the Wendy’s site, so you’ll just have to assume with this one. Order any burgers from the value meal and chop the patties into a Caesar salad. Order an extra chicken fillet on any sandwich. Order the grilled chicken patty with cheese and bacon on top. They have whole eggs! Order a bunless burger with an egg on the side. Carl’s Jr and Hardee’s are owned by the same company, so they have similar menu items with different names. Thankfully, there are plenty of keto options at both. You can have any of these burgers (except the Teriyaki Burger) in a lettuce wrap, just nix the bun, ketchup, and tomatoes if applicable. Carl’s Jr. has the advantage of the Lettuce-Wrapped Thickburger in both ½ and ⅓ pound sizes. At Hardee’s, you can just order the Thickburger without the bun for the same experience. For extra fat, add bacon and/or guacamole. For some extra veggies, get a side salad but don’t use the dressing. See Carl’s Jr Nutritional Calculator and Hardee’s Nutrition Calculator. Like Subway, any sandwich option can be ordered without bread. Just order it as an “Unwich” and you’ll be good to go with a low-carb lunch or dinner. The only downside is Unwiches can be pretty pricey for the lack of bread. But you can order “Slim” Unwiches too, which still give you a good amount of substance for a lower price. Sides here are chips or cookies, so stick with the Unwiches only. 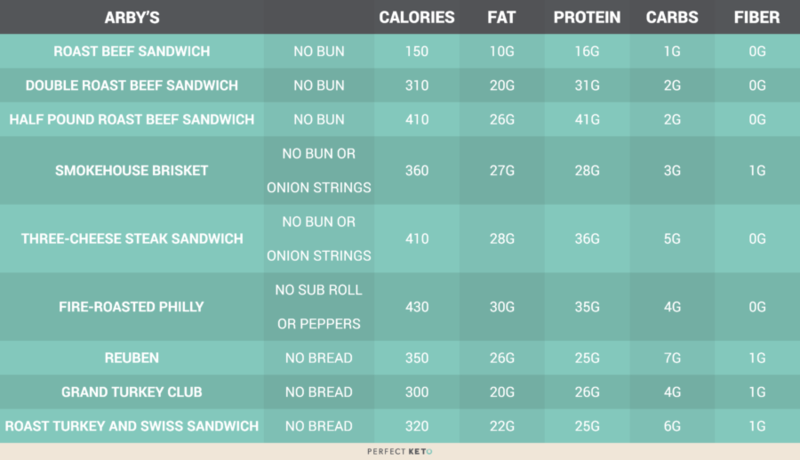 See Jimmy John’s Nutrition Calculator here. Another sandwich place where you can nix the bread (order it as “in a tub.”) Plus, their meats are sliced-to-order, so you’ll know they’re fresh. All of their Cold Sub sandwiches are good “in a tub,” but quite a few of the Hot Subs are higher in carbs — especially the BBQ Beef with 38 grams of carbs in one serving. You can see Jersey Mike’s Nutrition Facts here. You can order any of the burgers with a lettuce wrap or order it as a “salad” option. All of their toppings are virtually no-carb too, except for the BBQ sauce, ketchup, and relish. See their Nutrition Information here. The simple menu and easy low-carb options at In-N-Out make it perfect for keto fast food. Order any burger “Protein Style” to replace the bun with lettuce. You can also order your burger Double Meat, 3×3 (three beef patties), 4×4 (four beef patties), with mustard-cooked patties, or the Flying Dutchman — a “cheese sandwich” with two meat patties as the bun. See their Nutrition Info here. Fast food options are convenient, but remember the healthiest choice is almost always homemade. The ketogenic diet is all about reducing carbohydrate intake so your body can go into ketosis, using fat for fuel instead of glucose (carbs). 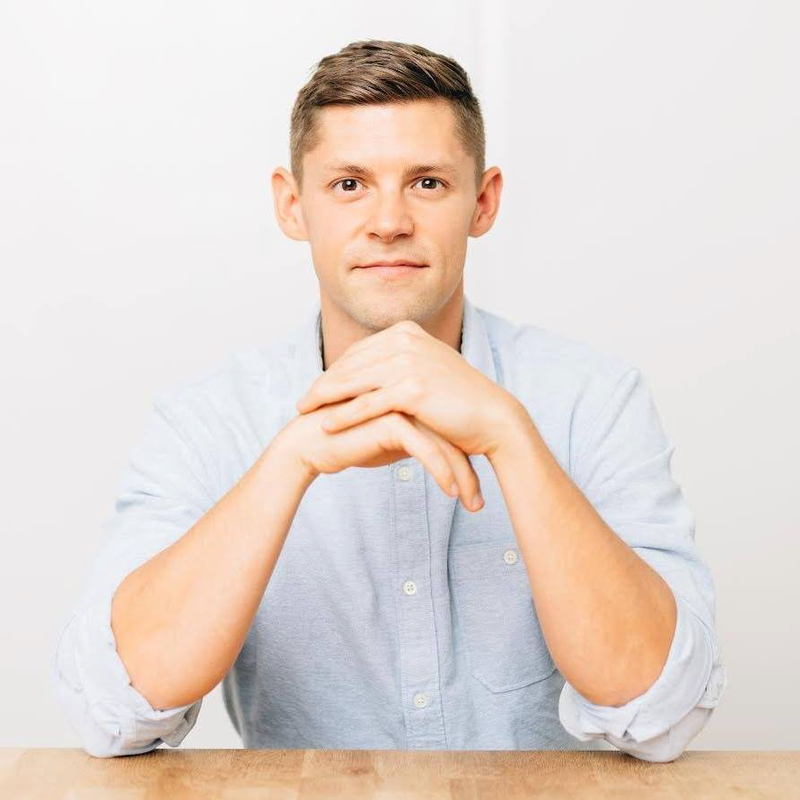 The ketogenic diet is only as healthy as you make it. And even if you’re technically in ketosis, getting real, whole, nutrient-dense foods is the key to living a long and healthy life. These recommendations are for emergencies only. And most of your diet should revolve around high-quality, fresh protein, plenty of vegetables, and healthy fats. If you rely on this list too much, you can completely stall your fat loss efforts. Inflammation can spike and mental and physical performance can suffer. Just because it’s low-carb doesn’t make it healthy. Click here to get the keto meal plan for free. But if you must eat fast food, rest assured that there are some ketogenic fast food options out there. Use the above options to guide you during your next fast food run, and don’t be afraid to get creative and customize. Why don’t you add Chic-a-filet. I’m a diabetic and believe this fast food place is great. No access to most of the other restaurants you mentioned. Wendy’s in New Zealand do a no carb burger. All the burger wrapped in iceburg lettuce. Easy to eat and filling. Not sure if they do it else where but it’s a standard menu item. 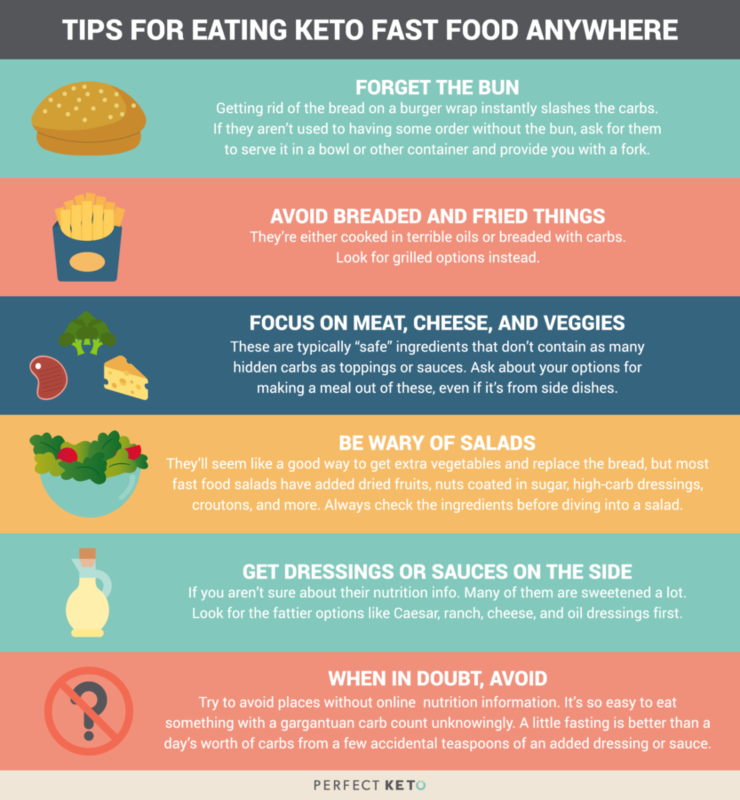 If you are eating keto you need to leave out the fast food….also some taco bell’s put oats in their meat so I wouldn’t recommend eating their meat. Maybe do a little more research about where you want to eat and don’t take posts like this at face value because different fast food places have a varied menus in different country’s or even states. Backyard Burger is another good one. Their burgers have actual cheddar cheese & not the processed american cheese. U can or without bun too – they make it with a lettuce “bun”. If you don’t have access to other fast food places then good for you, stick to what’s available. Red Robin… all beef and chicken burgers come as a lettuce wrap (careful of sauces as always) and toy can get bottomless steamed broccoli. Chic-fil-a has salads, use dressings in moderation and squeeze lemon juice for more moisture. It’s a bit of work, but scrape most of breading from chicken. chop and add over the salad like a chicken Caesar. Be careful with coleslaw. Thank you for putting all of this information in one place. I have printed pages 5-17 and will keep in in my phone. Freddy’s Burgers makes a great lettuce burger. They even wrap it in paper to help it edible with your hands. Hardees can make any of their burgers low carb. They wrap them in lettuce and leave out the bun and they are delicious! A&W PAPA BURGER or GRANDPA BURGER…..ate there a month straight once, and lost a ton of weight…. Yes! And their lettuce burgers are Delish! BGR The Burger Joint also has an awesome romaine lettuce wrapped burger and a ton of low carb topping options. Real cheese too. I am not sure what you would eat at Chic Fil A? I looked up their grilled nuggets and one of the ingredients is sugar. I was so sad. Hardee’s will do any of their menu sandwiches as a lettuce wrap. I get their chicken club when I find myself there. Also, Jimmy John’s does have one side item that’s keto friendly: their pickles! Grilled chicken nuggets at Chick-fil-a. Chick-fil-a should’ve been at the top of the list! Why are Carl Jr.’s burgers 11 carbs??? Freddy’s Frozen Custard and Steak Burgers is another one. They will put any of their burgers or hot dogs in a lettuce wrap for you. They are good too! Thanks for the info. We have a Burger Fi that also does lettuce wraps. Man this is awesome, so glad to know there is a sandwich shop that does lettuce wraps. All you need to add is chic-fil-A and clarify Hardies is Carl’s Jr for the people in here. Thank you for all this valuable information is very appreciated. The download also! Just want to let you know though I couldn’t save it to iBooks or anything else I had to take screenshots of it. Never have that problem with anything I’m downloading. Just want to write and make you awear of it. Thanks for everything again !